A study of the Hebrew language in order to master the basic principles of its grammar (orthography, morphology and syntax). Selected passages of the Old Testament are read. Fall and Winter Semester. A study of the transmission of the Hebrew text, the history and significance of the versions, and the practice of textual criticism. Fall Semester. A study of the principles and practice of interpreting the Old Testament in order to help equip the student for the task of exegesis. Winter Semester. Narrative passages are read with due attention given to the Hebrew grammar. Prerequisite: 1101 Old Testament Hebrew. Fall and Winter Semester. 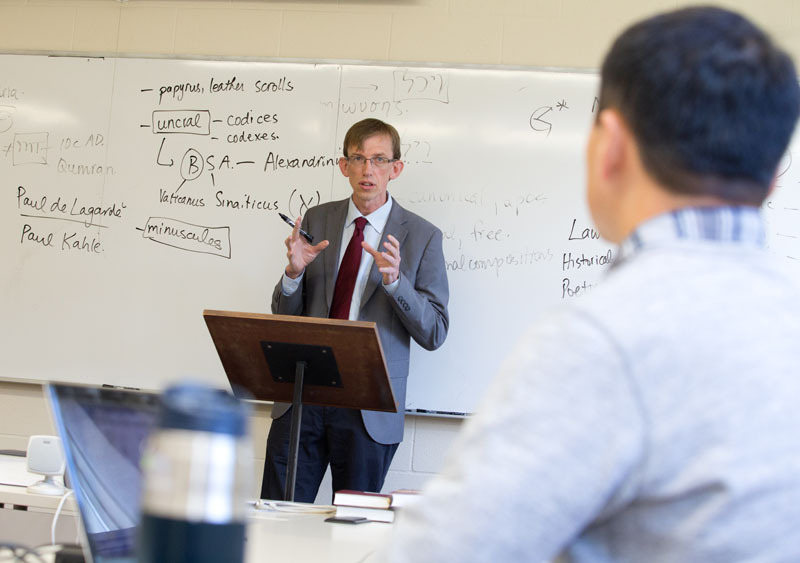 This course studies the events of the Old Testament in their larger Ancient Near Eastern context. Attention is given to the geography, archaeology, history, and social and religious institutions of Israel in the context of the surrounding nations. Winter Semester. Selected passages from the Pentateuch are studied, mainly in seminar format with a special emphasis on the text, translation and message. Occasionally an excursus on a subject related to the text is given. Fall Semester. Selected passages from the Prophets are read, with due attention given to the Hebrew grammar. Prerequisite: 1101 Old Testament Hebrew. Fall and Winter Semester. A study of the origin and specific character of the books of the Old Testament. The authorship, date, contents, structure as well as the special place or purpose of each book is discussed. Attention is also given to the history of the study of Canonics as well as current trends in this field. Winter Semester. This course studies selected passages from one of the Prophets or Writings, mainly in seminar format, with a special emphasis on the text, its translation and message. Occasionally an excursus on a subject related to the text is given. Fall Semester. An introductory study of the grammar of Biblical Aramaic. Aramaic portions of the Old Testament are studied. A good knowledge of Hebrew is assumed in this course, which will be offered only if feasible. Prerequisite: 1101 Old Testament Hebrew and the permission of the professor. Fall Semester. Selected poetic passages are read with due attention given to the Hebrew grammar. Prerequisite: 1101 Old Testament Hebrew. Fall Semester. A study of the history of Gods revelation in the Old Testament from creation to the end of prophecy. Included in this course is an orientation in and critical discussion of past and current Old Testament theologies. Fall Semester.